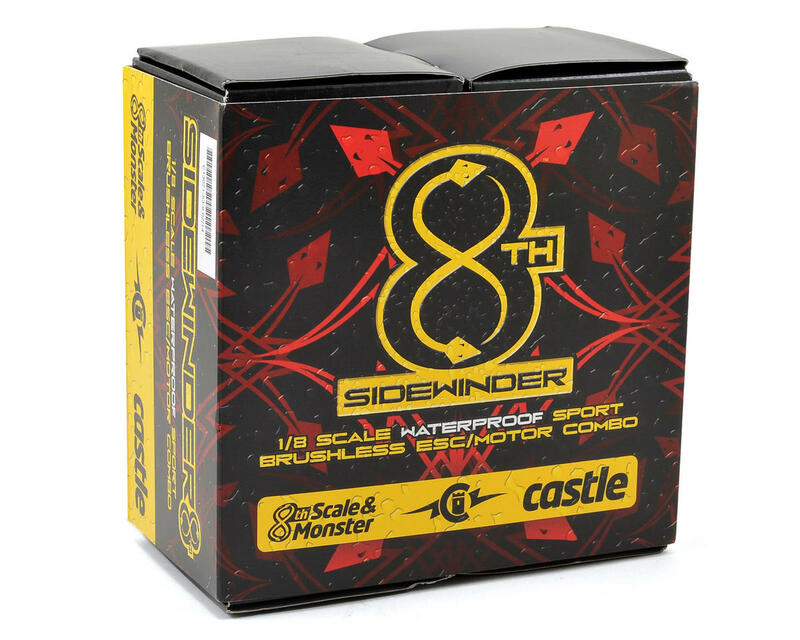 This is the Castle Creations "Sidewinder 8th" 1/8 Scale Brushless Car Package, with an included 2200kV motor. Lean and mean like the smaller SV3, the Sidewinder 8th features everything you’ll need to toss buggies, truggies, and monster trucks around like a rag doll. Any vehicle weighing in at up to 11lbs and running up to 6S LiPo is fair game. Its powerful BEC will laugh at nearly every servo on the market today, and its potted design will tolerate wet conditions without flinching. 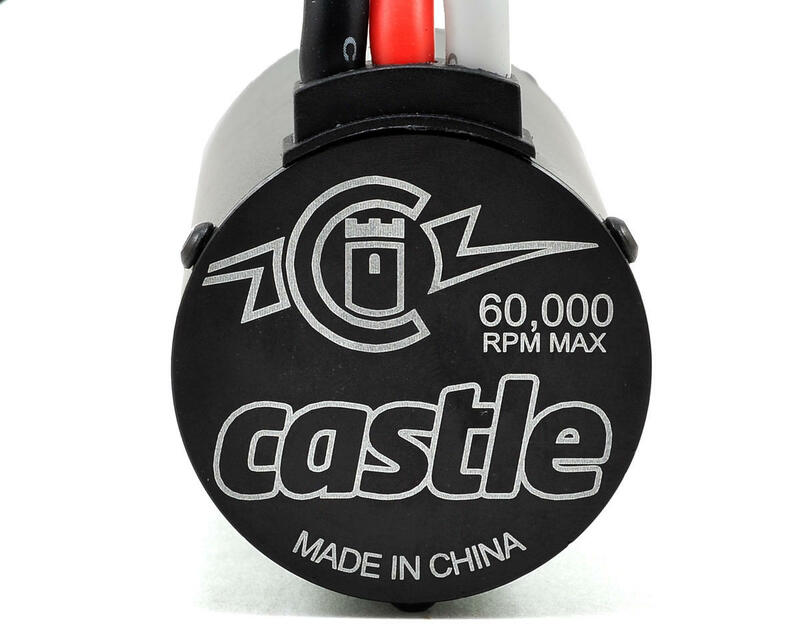 Paired with Castle Creations 1515B-2200kv motor, with the same internal design as Castle's award winning NC-1515-2200 motor, it’s got the power to take on the competition. 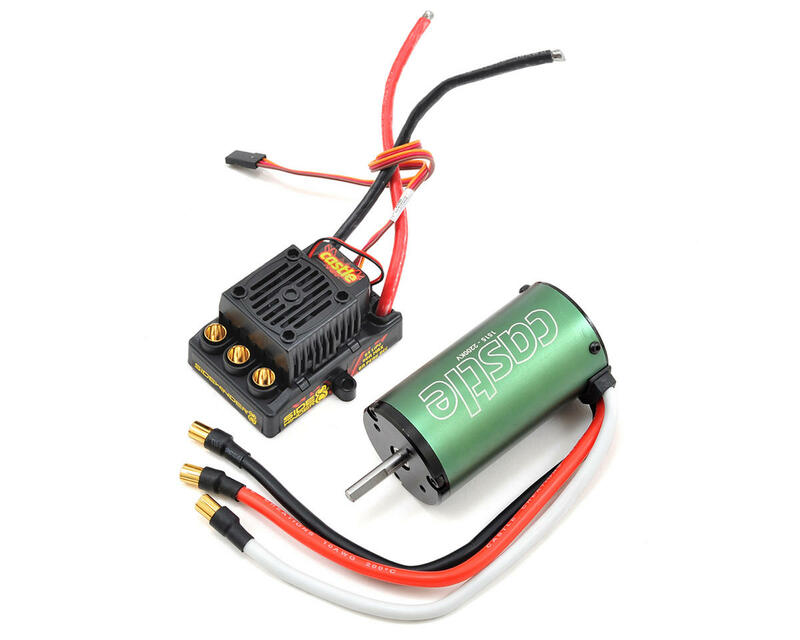 Compatible with applications up to 6S (25.2 Volt), this motor is incredible in monster trucks, and works great in 1/8th buggies and truggies as well. The ESC is equipped with the state of the art software that Castle is known for, and has USB programming capability using the Castle Link USB Adapter (sold separately). So pound on snow filled parking lots, beat the muddy trails into submission, and tear streams a new one. Tell em 8th sent ya. Although Sidewinder 8th and Castle brushless motors are waterproof, they can corrode when exposed to corrosive materials, such as salt water. Always rinse the ESC and motor with clean water after exposure to corrosives or dirt. While the motor and controller may be waterproof, Castle suggests users confirm that the rest of their vehicle, including the batteries, servos, radio and chassis are also waterproof before exposing them to liquids of any kind. ok so i have a Revo 3.3 nitro. I bought the sidewinder and tekno rc conversion kit(TKR4001) and 2X traxxas 3cell 5000mah batteries and now I'm scared of it. it go so fast now i can barely keep control of it. i love this motor. wheelies are now on commend. no messing around with tuning. i would recommend this to anyone doing a nitro to electric conversion. Very good system. I put it in a 1/8th scale Hpi Trophy Truggy Flux. Even though the specs are low it doesn't matter it has more than enough torque then needed. I'm only running 4s LIPO and its very impressive. All around this an EXCELLENT system. 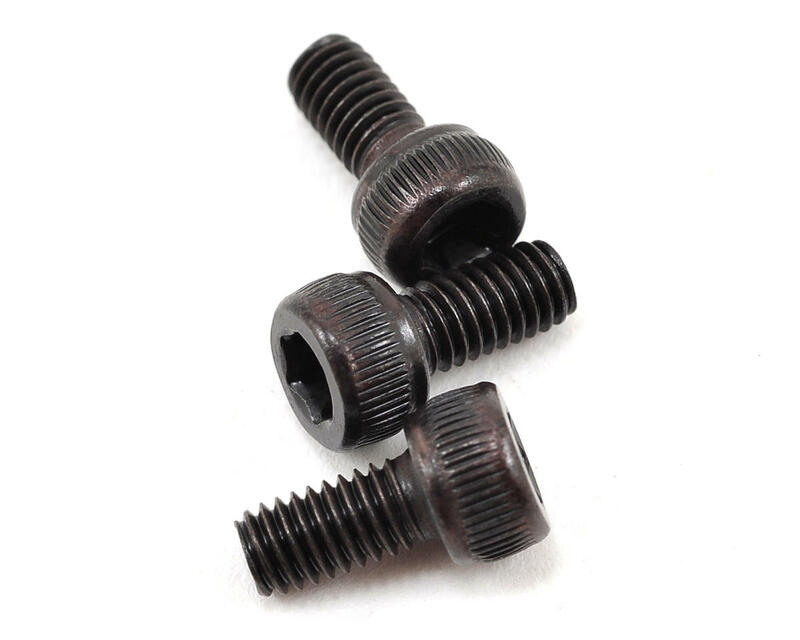 The adjustability, speed, power and price are superior to other systems. Even while running the esc doesn't break a sweat. Its not far at all from the mamba monster. You can't even tell a difference from its big brother. Castle has done it again! BUY IT YOU WON'T REGRET IT! I didn't purchase it through amain but I am currently running it my 8ight t 3.0 and I'm not enjoying it much at all. It has a lot of grunt but after a few laps on a mid size tracks then it starts hesitating. Started with 45/15 spur/pinion and dropped down to 45/12 spur pinion and still have the issue. I won't be bothering to RMA it since it's going in a 4x4SC next spring but spend the extra and get a tekin rx8 w/2000kv. You won't regret it!